In Search of Spirits — The Elusive Kind, Part II | Are We There Yet? Are We There Yet? Ric Hallock blogs about being a family man dealing with life in and around Gig Harbor. As the evening sky darkened, distant flashes illuminated the gathering clouds, followed by a low and ominous rumble as the thunder rolled across the sky, accompanied by gusts of wind shaking the alders and pines that surrounded our diminutive camp. A handful of paranormal enthusiasts — along with an invited, spirit-beckoning “medium” — and a confirmed skeptic (myself) gathered together July 11 outside the McReavy house, perched atop the steep hillside overlooking the Hood Canal in Union, which has stood empty of living residents for nearly 40 years. The purpose was to investigate purported paranormal activity (read: ghosts) that might be present at the site. My job: to help document the event in video and still digital images. The image above is of the medium channeling “Mary,” a young girl who told us, through tears, of her having great difficulties while swimming alone. 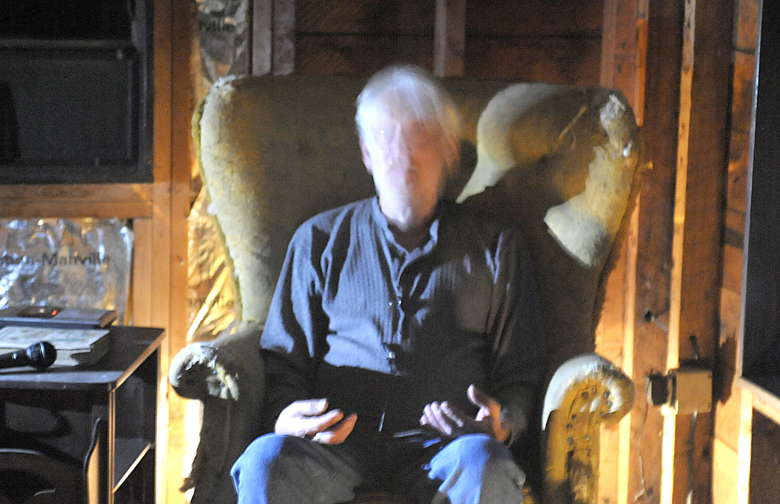 The blurred effect is a result of a slowed shutter speed due to only two dim light sources, one directly behind the chair he is seated in and a second coming from a video camera off-screen to the left. Built by John and Fannie (Gove) McReavy in 1883, the house certainly held the charm of being home to unearthly spirits. Willed to the local historical society by the heirs of the last couple to live in the home — McReavy’s daughter, Helen (who wrote “How, When and Where, On the Hood Canal,” 1960 Puget Press) and her husband — it has long been cleared of most of the interior furnishings. In fact, before the couple died (in 1969 and 1970) it appears they had come into some money and had started a major renovation of the home, both inside and out. They removed the Victorian style pitched roof in favor of a flat beam and plank venture, essentially lopping off a third-story room just visible in some historical photos. And the first and second floors were in various array of having the interior wood plank wall coverings replaced by sheetrock. As a result, much of the internal charm was boxed up, as fancy moldings and cornices that framed the doors and windows had all been removed to accommodate the remodeling work. The reality struck me as a far more poignant story. Imagine remodeling your entire home and in the middle of the work, your spouse dies. For upward of a year, you continue to live in the home, but never complete the work, instead living our your days in a home with one foot in the 19th century and one foot in the 20th century. It must have been a lonely final year for Mr. Andersen. The only remaining vestiges of the home’s original interior were the doors, hinges and some wallpaper remnants stubbornly clinging to some surfaces. The unfinished basement provided tantalizing clues to former occupants with a mishmash of home knickknacks from rolling pins to teacups and records to steamer trunks covered in the dust of dried mildew. One item of particular interest was the front page of a Good Housekeeping magazine dated 1894 — it was found lying on the floor where it had doubtless been tread upon for decades. Ivy tenaciously invaded one eastern window, preferring the controlled climate inside to the harsh weather blowing off the canal’s shores to the north. The house itself had stories to tell — an intriguing one lingered about the internal fireplace with a partially dismantled brick chimney and insert installed. The backside of the fireplace faced a back room where the wall was exposed, showing burned timbers where a chimney fire must have put quite a scare in the residents of the time. They were lucky indeed that a timber house of well-seasoned and dried wood didn’t literally explode in flames, as so many homes of that era would do when exposed to fire. And where the chimney had been removed, a member of the party discovered a large piece of cut tree trunk, bark still clinging to it, wedged between the first floor ceiling and second floor flooring. We surmised it must have been some tradition of putting a piece of unfinished wood from which the home was being built into the home to either bring good luck or ward off bad. In an unfinished crawl space along the western side of the home, a large knarled tree stump measuring several feet across was left — obviously deemed too much trouble to try and uproot, they cut it to its base and built the home above it. But if there were spirits lingering about with stories to tell, they remained elusive to our party. The medium — by his reckoning — was successful in raising a half-dozen denizens of the past. But proof of this reality must be measured in quantifiable facts and every attempt to question a channeled spirit on a detail that could be fact-checked was adroitly side-stepped or ignored. For example, when asked what book they last read, each and every one of the channeled spirits answered, “The Bible.” And of the channeled McReavy himself, an important businessman and one of the signers of the state charter, whom you would think would be in keen touch with the world around him and the comings and goings on in his own personally named “Venice on the Hood Canal.” But when I asked him what was the name of the newspaper in town, he replied, “I don’t care about newspapers.” Remember: this is the late 1800s when no other form of mass communication existed. Do you really think a man of his stature wouldn’t care to keep up on the news in his community? I caught the medium in a few outright errors as well (that hopefully the rest of the group will pick up on as they review the videotaped sessions). His first spirit said he was a visitor in the home in 1880 (remember, it was built in 1883) and later when he channeled McReavy, presumably John as he referred to the home as his and wondered at the renovations, he said he built the home in the 1870s and later referred to the master bedroom as a guest room. Some of the party saw validation of their beliefs in the medium’s manifestations while others maintained their doubts, but having been a theater major many years ago, I must admit that to me the mood lighting and channeled spirits who each rather conveniently “had to go” after a few minutes seemed more like a poorly staged one-act play than anything even beginning to approach reality. To get a glimpse of the fun we had that night, check out the video here — apologies for the poor quality, but the lighting was limited. I know one other member of our expedition was as skeptical as I when he asked a spirit if they liked to eat salmon. The evening petered out around 4:30 a.m. with everyone succumbing to the Sandman, slinking away to find his or her sleeping bag or tent. For what its worth, I will share my notes and observations with the group and they are free to include or exclude whatever part they desire as they prepare their report of the happening of the night. As for me, I continue to remain skeptical, having not seen or heard anything that would change my mind. Although the stories that flowed around the room between channeling sessions and also around the campfire outside were anecdotal and filled with provoking details of secondhand sightings, I chalked up the night as being akin to a grown-up version of camp night, where the campers would gather about a fire nestled deep amid rustling trees and snapping branches as a camp counselor weaved a tale of suspense and terror of a haunted night long ago at the very site. The scariest moment I had was while driving away and pointing down Main Street on a very, very steep incline and imagining the brakes giving way to a fast and furious ride down the hill, across a short gravel parking lot and straight into the cold waters of Hood Canal. That would be a chilly fright indeed. Gig Harbor, nestled in the northwest corner of Pierce County, snugly between Tacoma and Bremerton, is fast shedding its small-town demeanor as people seeking to escape the hectic pace, congested traffic and high cost of living in the big city continue to “discover” the fishing village in the harbor. With the influx of population, Gig Harbor continues to morph and develop, coming of age — as it were — as it defines its place among the many communities that dot the waters up and down Puget Sound. Kitsap Sun Special Sections Managing Editor Ric Hallock (whose responsibilities include Gig Harbor Life), lives in Gig Harbor and finds that reason enough to blog on living, breathing and spending money in the Maritime City.